As you progress through your BA degree, there will be lots of opportunities to further your personal, academic and professional development. Make use of the tools above to strengthen each aspect of your holistic career development. Identify your skills, interests and values. Don't forget about your growth edge! Develop awareness, insight, and understanding about yourself. Start by browsing the Self-Reflection resources. Connect your experiences throughout university to the life you want after graduation. Co-curricular engagement opportunities can help bridge the gap. Develop your analytical and communication skills and foster your confidence to be an independent thinker. Prepare yourself to effectively sift through complex webs of information and ideas. Learn how to frame and apply the skills that you are developing through your BA degree (i.e. research ability, working collaboratively, etc.). 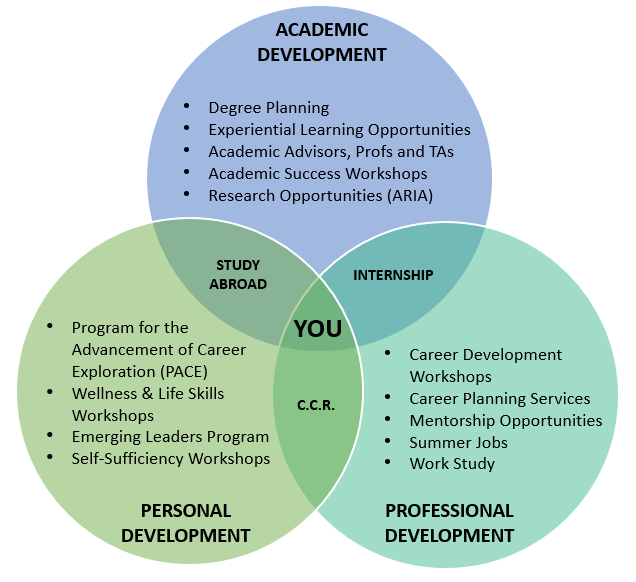 See connections between different courses, contexts, situations, and experiences. Develop transferable skills around working in teams, exercising leadership, or taking initiative. Seek opportunities available to leverage your potential for success on the career path that you choose. Use the Career Connector to start!